The potential of using the sense of touch to communicate information in mobile devices is receiving more attention because of the limitations of graphical displays in such situations. However, most applications only use a single actuator to present vibrotactile information. 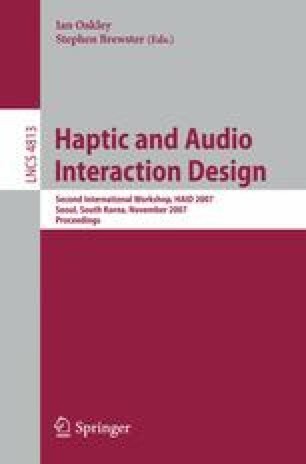 In an effort to create richer tactile feedback and mobile applications that make use of the entire hand and multiple fingers as opposed to a single fingertip, this paper presents the results of two experiments investigating the perception and application of multi-actuator tactile displays situated on a mobile device. The results of these experiments show that an identification rate of over 87% can be achieved when two dimensions of information are encoded in Tactons using rhythm and location. They also show that location produces 100% recognition rates when using actuators situated on the mobile device at the lower thumb, upper thumb, index finger and ring finger. This work demonstrates that it is possible to communicate information through four locations using multiple actuators situated on a mobile device when non-visual information is required.